I chuckled and smiled as he hugged me. He smiled back, his eyes crinkling in an infectious way that I love because I’m his mother. Here he is, age 12, with his little sister right behind him, age 9. 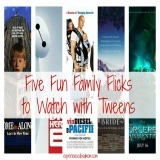 Our family is solidly in the tween zone, barreling towards the teen years. Besides my kids’ ages and my son’s comment about hitting puberty, I have noticed many signs lately that my kids are no longer little, yet not exactly big either. Your child has a cell phone. You don’t shop for clothes at Gymboree or Children’s Place anymore. You can’t remember the last time you bought a Happy Meal. You’ve resolved that video games are a part of daily life. You’ve resolved that eye rolling is a part of daily life. You buy your child deodorant instead of baby wipes. You can share your shoes with your child. You no longer sign up for activities in the children’s department at the library. You know about Deez Nuts, Dabbin‘ or Damn Daniel. You have no idea who Sophia the First or Jake and the Neverland Pirates are. You are not cool anymore and getting less cool by the minute. 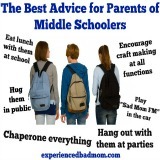 Yup, you know you are the parent of a tween when you experience these moments. Now, if you’ll excuse me, I have to go yell at my son to get off his phone. He’s been playing some video game on there for way too long and he left something in the microwave that smells like it’s burning. Maybe I’ll sneak a hug in there, too. 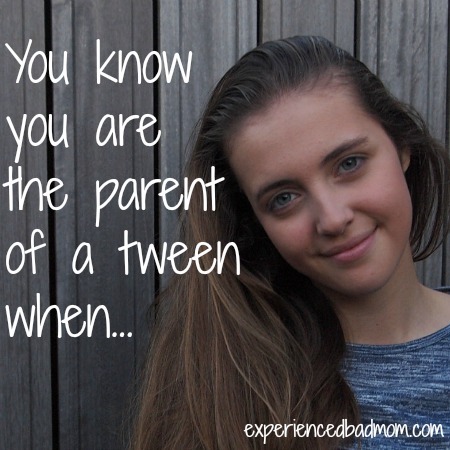 Are you in the tween or teen years? How did you know? 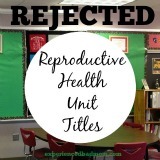 Looking for more tween posts? It’s bizarre, isn’t it? Having little people around still keeps me young. I get the pleasure of hearing my older kids drone on about Minecraft AND my little kids drone on about Daniel Tiger! See? I don’t even know who Daniel Tiger is. Maybe I’m missing out. Damn, Katy, thank you for including the illuminating links. Had no idea of either three. Mind you my two are beyond the tweens and currently either sunning themselves in Cuba or in the midst of writing papers. LOVE your list. However, I have to report the three of us never shared shoes. I shared a pair with my mom when her suitcase didn’t arrive on our trip to London and she swears she got her painful corns as a result. Between you and me, I think your son will always find a moment to tell you he loves you. Puberty or not. Want to make a bet? Canadian dollars, of course. Uh… I’ve no idea about those things either!! I suppose I should go back and click on the links, yes? This cracked me up, because you KNOW I am in the *almost* exact same boat as you mama! What your son said? PRICELESS. Hang in there, Katy. There will be rough seas for a few years but, as they say, this too shall pass. I’m realizing more and more how appropriate the word “tween” is. Some days mine is doing online research, cooking her own breakfast, and rolling her eyes at me; and other days she’s playing with baby dolls and sitting in my lap! I can totally relate! And I love the snuggles still, but my kid is so big, too, that I’m usually thinking GET OFF ME.